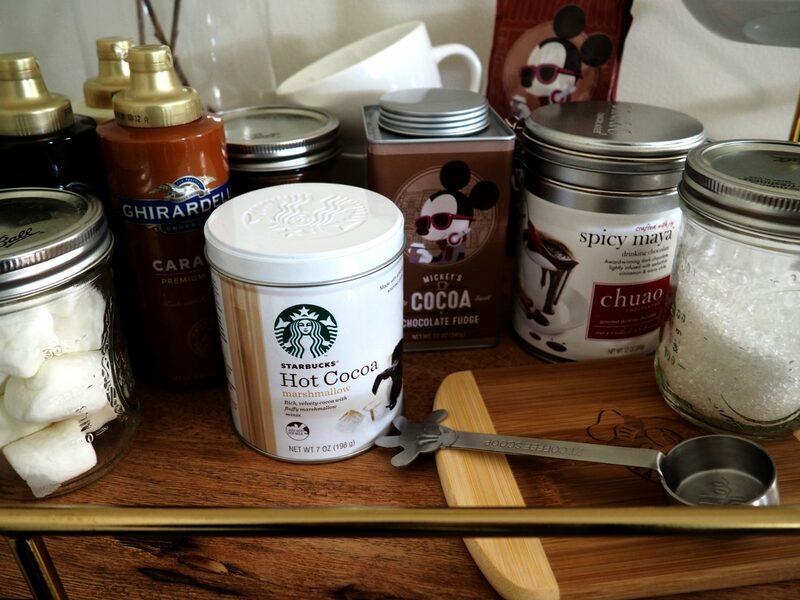 Ready to build a Hot Cocoa Bar? You’ll need to have warm delicious drinks around all season. 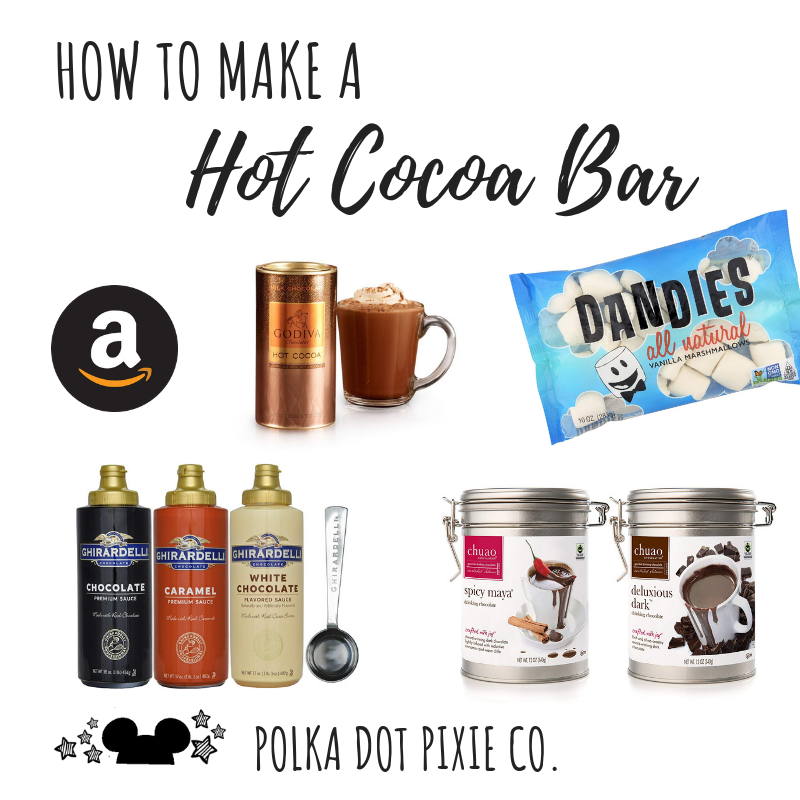 This combination of cocoas and fixings is a Must-Have for the Foodie embracing the fall and winter months. 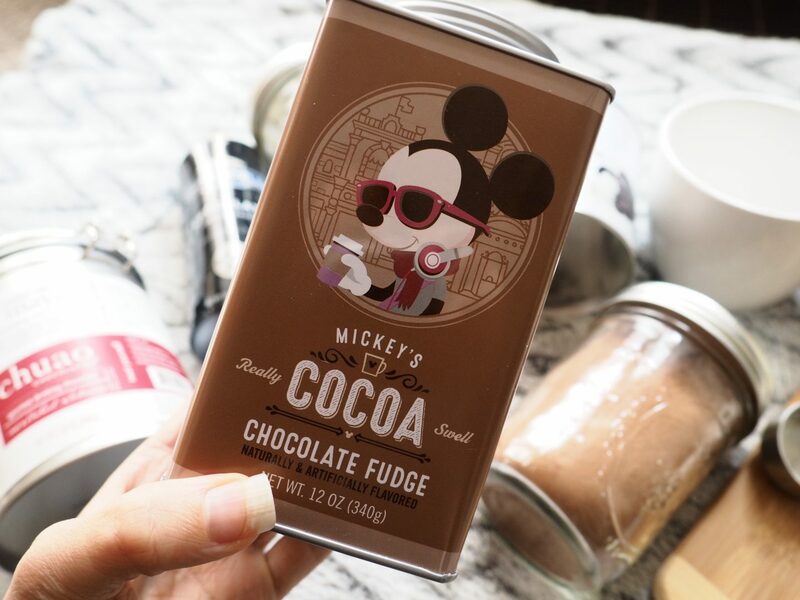 This hot cocoa bar is Disney themed, but perfect for grown-ups. If you love gourmet cocoas, make this hot cocoa bar project a #goal for yourself as you get ready for the cozy season. 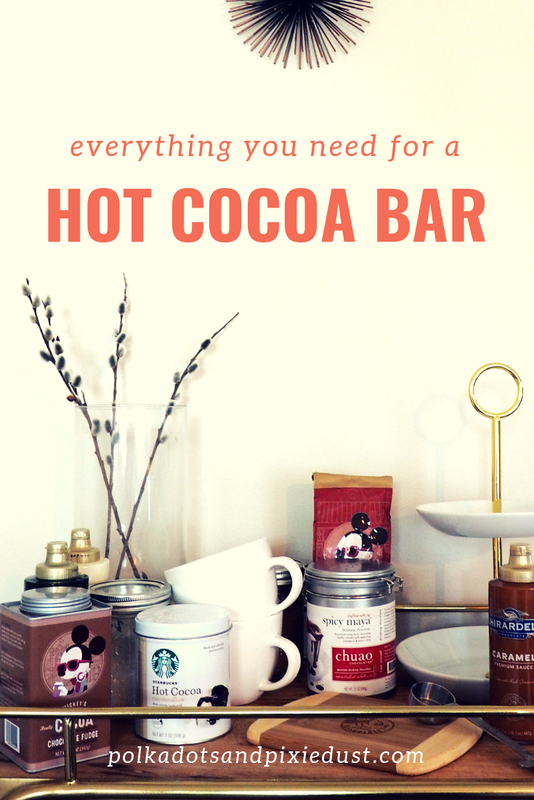 Why do you need a hot cocoa bar? Frankly, we make up lots of reasons to need things that are cozy in the colder months. Footie pajamas, more candles, more hallmark movies, more socks. A reason to drink hot chocolate as often as possible. Where we currently live it’s cold for like half the year! So any opportunity to add some warmth to the house, a party or a visit is reason enough for us! It’s should also be no surprise that we like really lovely things, though usually grab things on sale to help us stick to our “need to visit Disney all the time” budget. The list includes loads of amazing hot chocolates, gourmet chocolates, drinking chocolates and decadent fixings that you would be proud to call your own. First things first. You’ll need a bar cart. Ours is from Target and oh so versatile! Grab this one from Threshold for something amazing, simple, elegant and fits anywhere. This cart gets used for all sorts of things besides drinks! At Christmas it sometimes acts as a mini-tree stand. In the summer, it’s the perfect place for appetizers and bags of chips. Sometimes it just holds flowers. 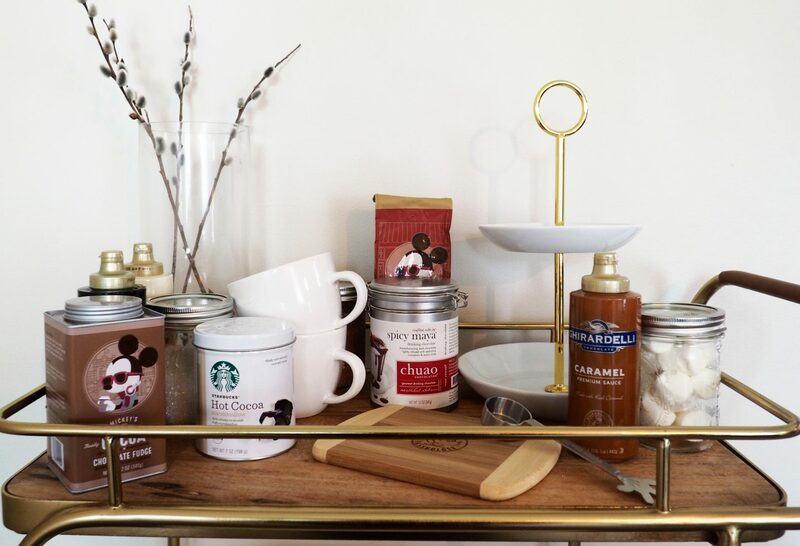 This fall and winter, it’s holding loads of drink necessities for a Hot Cocoa Bar. So, lets face it, we’re not going to be home the entire fall and winter seasons entertaining people to come hang out with us at this amazing hot cocoa bar. We probably all still have jobs after all. So we’re going to need to be mindful of how to make this hot cocoa bar last. Here are our tips. Buy cocoa in tins, or individual packets. 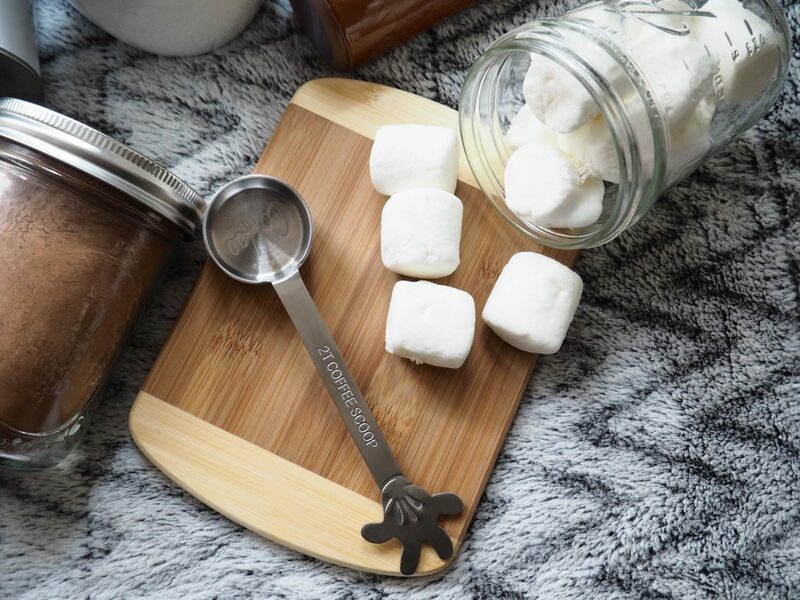 Transfer marshmallows, stirrer sticks and other cocoa additions to mason jars as well. Perishables like milk or creams should be stashed in a separate spot in the refrigerator if possible, like a drawer, so they don’t “accidentally” get used on everyday things. We highly, highly, recommend grabbing a glass electric teapot. Plastic is just bad for you. And this teapot is perfect to quickly heat up water for tea, coffee, and cocoa. Buy a coffee specifically for the hot cocoa bar needs, it too will surely get used on the everyday if not set aside. Paper cups with lids : We got these cups to stock our bar, because they were cheaper, paper, came with sleeves, and stirrers, and in a pretty mocha color that matched the bar cart theme. We also love that they are to-go… so you can truly entertain people in a pop by, have a cocoa and go fashion. You can also use mugs if you are hosting small party and won’t mind the dishes. Napkins: Let’s be honest here, if there is cocoa, we probably also have cookies or a treat laying around somewhere that will need a napkin. So we got these cute napkins just in case. Spoons: We tend to avoid plastic since, but you can grab spoons from your kitchen or just use the stirrers that came with the cups suggested above. Milk Chocolate Hot Cocoa: There are so many varieties of hot cocoa out there, really any of them will do. For a Milk Chocolate version we like this one best, because it’s organic and fair trade or this basic Starbucks one. But if you’re looking for something more budget friendly, this Whole Foods brand hot cocoa also does the job just fine. The Starbucks Double Chocolate is also pretty great and comes in the cutest tin. Dark Chocolate Hot Cocoa: Nothing compares to the Christopher Elbow Cocoa Noir Drinking Chocolate. Mexican Hot Cocoa: We love this Spicy Aztec Chocolate from Lake Champlain Chocolates or this Dagoba drinking chocolate with cinnamon if you’re looking for something a little unique and grown up for extra cold days. 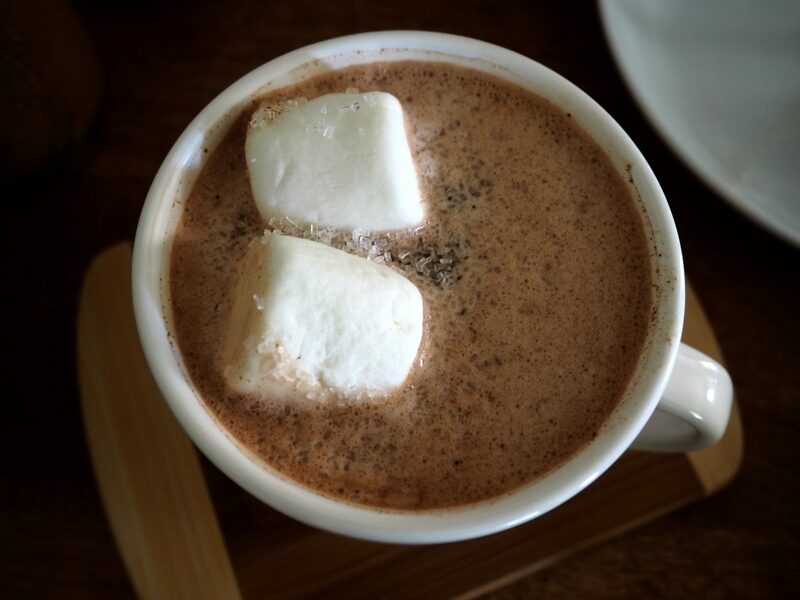 Luxury Hot Cocoa: We like Ghirardelli for all things sumptuous. Grab the smoothest hot cocoa ever here. We also like this kinda pricey drinking chocolate ( whisk included) from L.A Burdick. Salted Caramel Hot Cocoa :This caramel hot cocoa is salty and sweet and perfect as an evening treat, no dessert required! Peppermint Hot Cocoa: For all those peppermint mocha fans out there, you can add this cocoa to black coffee, instead of creamer, to get your minty fix. Pumpkin Spice Hot Cocoa: Williams and Sonoma always has the most lovely things for the holidays. 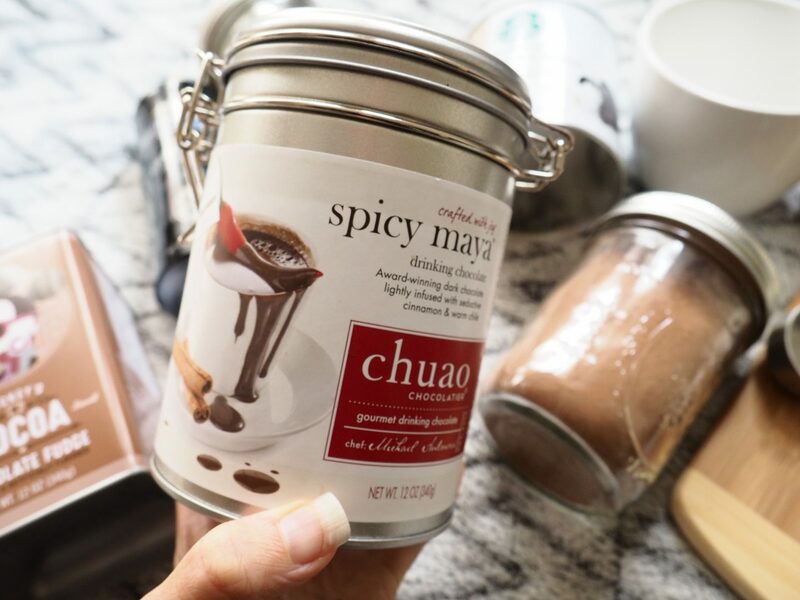 If you’re a PSL fan, grab this cocoa to add to your coffee. Homemade Hot Cocoa Mix: Perfect for vegans or non-milk drinkers. 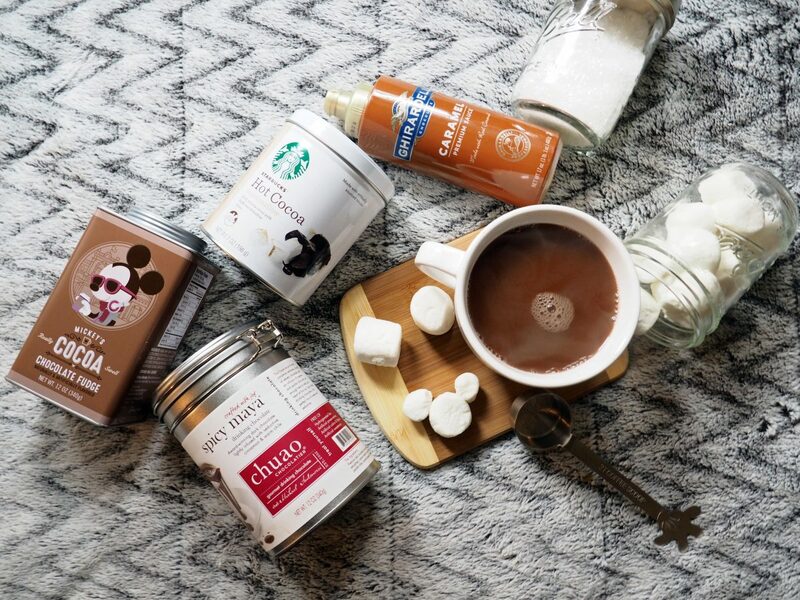 Check out the recipe below for a simple homemade Hot Cocoa Recipe. Big Marshmallows: We go for regular S’Mores size marshmallows sometimes in our drinks, to get the cocoa extra creamy. You can grab Vegan Marshmallows here. Small Marshmallows: These mini dehydrated marshmallows are perfect for cocoas and little kids loving to pile them on! You can also grab the traditional jet puffed marshmallows to keep on hand as well. Fancy Marshmallows: These snowmen marshmallows are so adorable you won’t want to eat them! But they sure to make a cute addition to your hot cocoa bar. Chocolate Chips: We like milk chocolate chips, semi-sweet chips, peanut butter chips and white chocolate chips. Mini chocolate chips are also excellent to have on hand. Sprinkles: Any edible glitter, sprinkles or pixie sugar will do. We like this for a glittering snow effect. Caramel Bits: The Kraft Caramel Bits are also great to use in cookies for the cozy season. 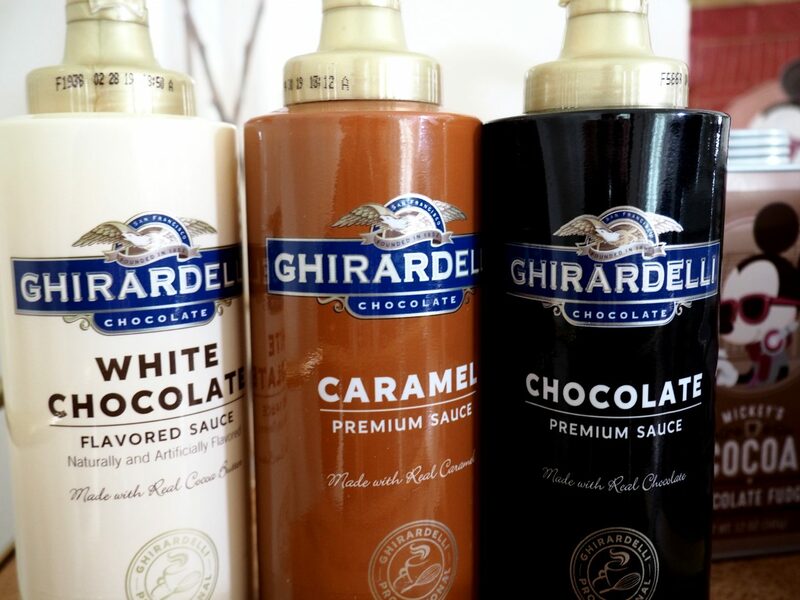 Syrups: We like the Ghirardelli chocolate, caramel and white chocolate varieties. Graham Cracker Crumbs: Graham crackers are good to have around for all your s’more needs. Just grab some on your next grocery run! Coffee: Its always a good idea to have coffee brewing, for those grown ups excited to make cafe mochas instead of straight hot cocoa. We like caribou coffee best, though any will do. Almond Milk: So we find that almond milk, unsweetened makes the creamiest sort of hot chocolate. But of course dairy milk works just as well. Dry Milk: If you want to mix up your own hot cocoa mix. You need cocoa, sugar and dry milk. Grab this dry milk to make a few batches. 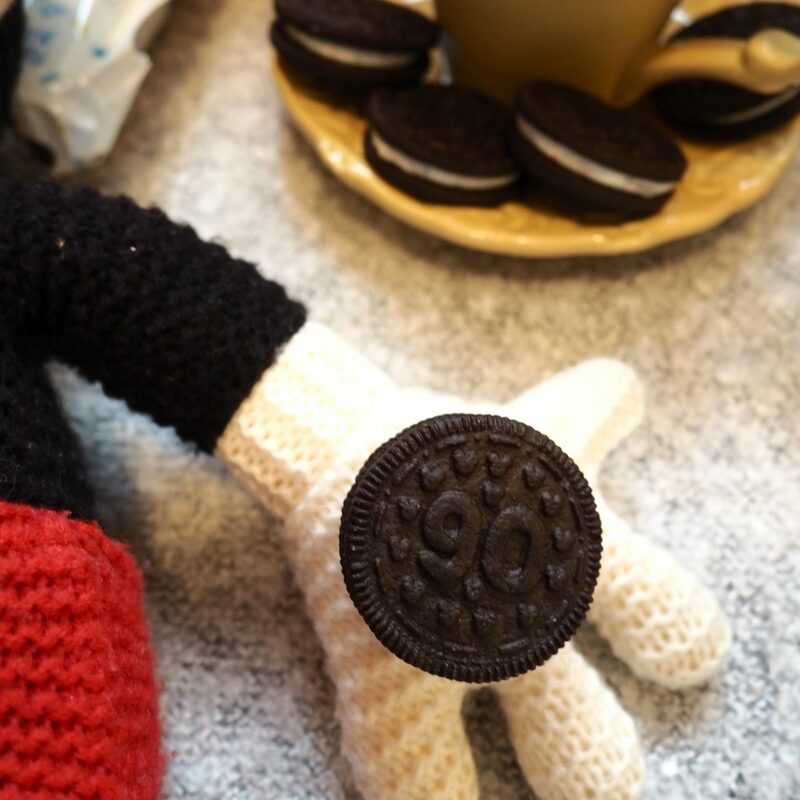 Oreos: There are special Oreos available for Mickey’s 90th birthday in 2018. Disney Mug: Since we weren’t using actual dishware for cocoa (imagine the dishes!) we added in a cute mug to hold some flowers. This keeps it fun, light and seasonal. Disney Plushies: The typical bar cart often runs the risk of looking too presumptuous. 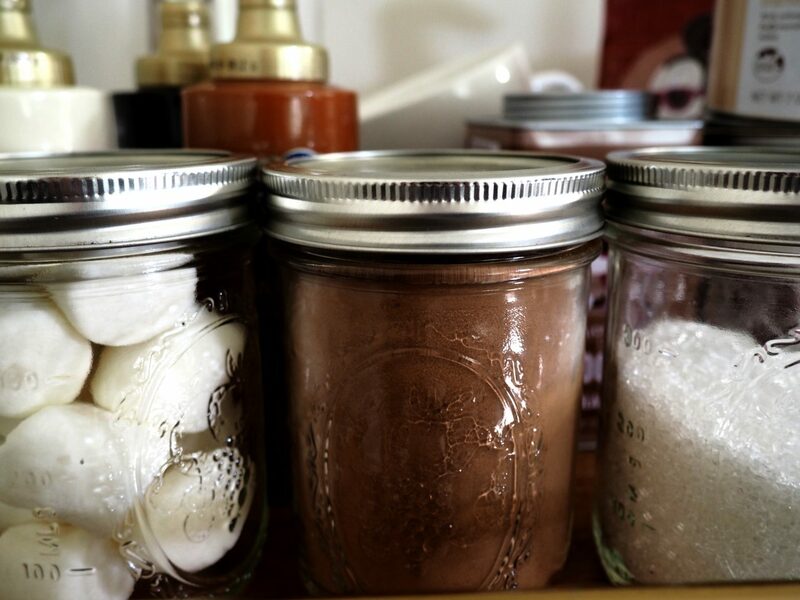 You don’t want guests, or visitors to feel like they can’t touch your cocoa. So we added a few fun touches that brings it all back down to earth. A Candle: So as long as your cocoas and fixings are in mason jars, or packets, you can burn a cozy candle nearby without worry of it affecting the flavors. We like any from here to help get people in the mood for a cozy treat. If you’re not in the mood to break the bank on your hot cocoa bar, no worries! 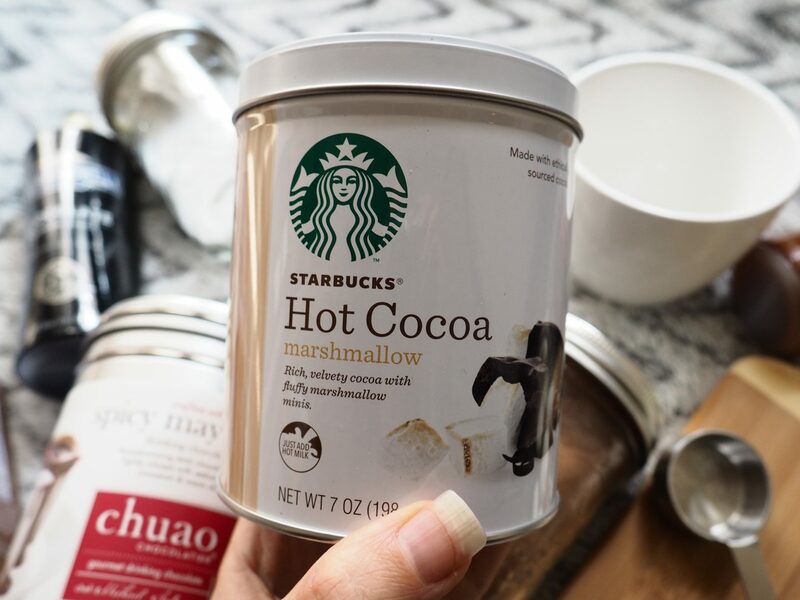 You can still make it amazing by whipping up a batch of your very own hot cocoa mix, perfect for the vegans and lactose intolerant in your life. It’s a dry recipe , so just add whichever milk you prefer when you’re ready to make it. Step 4 Keep up to 2 months in a cool, dry place.